Have your calendar ready? Circle August 7th. That is the date when Korean manufacturer LG will hold an "international media event" in New York City. 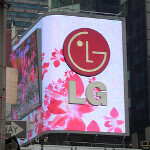 So what will we see from LG as the dog days of summer start to beat down on the Big Apple? We might have received a clue on Wednesday when LG announced that it would team up with Qualcomm to place the Qualcomm Snapdragon 800 processor inside its LG "G" series phones. As we already discussed, LG is no longer putting the Optimus name on its high end models and is reserving the title for those phones it considers low to mid-range. High-end LG handsets will be known as the "G" series. We have been expecting the sequel to the LG Optimus G which had been dubbed the LG Optimus G2. Considering LG's announcement involving the removal of the Optimus name from its top-shelf phones, we could see a whole new name for the phone during the event. Calling it the LG G2 might be a little confusing since there was an LG G2x, which you might recall as the U.S. version of the LG Optimus 2X. This was one of the first dual-core smartphones to hit the market. Perhaps we will find out more about the mysterious LG handset we saw not once, but twice last month. This unnamed model had no front buttons, a thin bezel and a slight camera hump. It could be the LG Optimus G sequel, but we should know more after the event. Please don't let the phone be bigger than 4.6~4.7 inch.